While a good deal of Americans opted to avoid talking politics around the Thanksgiving Dinner table this year, one topic filling the void was bitcoin. Whether it was a cousin bragging about buying it more than a year ago, or your uncle adamantly steadfast in his belief that the whole thing is a bubble, there’s a good chance someone mentioned it. With all the talk about bitcoin, a good deal of people are also starting to open accounts where they can buy and sell crypto-currencies. Coinbase is one of the largest platforms where consumers and merchants can transact in digital currencies like bitcoin and ethereum, and as bitcoin prices have surged, so too have the number of users on the platform. Just Wednesday, the company disclosed that the number of users on its platform had reached 13 million, but since then another 100,000 users have opened accounts! To put this number of users into perspective, consider the fact that as of the end of 2016, Charles Schwab had 10.2 million brokerage accounts. Yes, Charles Schwab has a lot more assets in its accounts than Coinbase users, but the idea that crypto-currencies users are just a fringe part of the financial universe is not accurate. The chart below shows the rate of change in bitcoin and the number of Coinbase users over the last four years (thanks to @alistairmilne for the user data). Not surprisingly, as prices have surged, so too have the number of accounts. 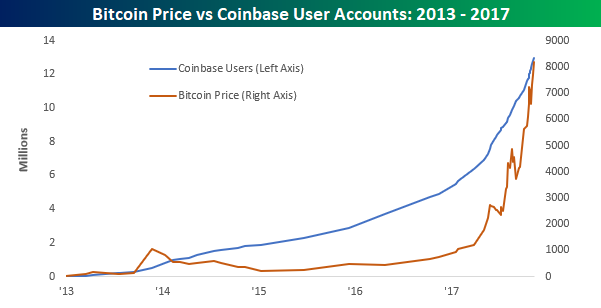 In the last 12 months, as the price of bitcoin has increased more than ten-fold, the number of Coinbase users has increased from 4.9 million up to 13.1 million, for an increase of 167%.